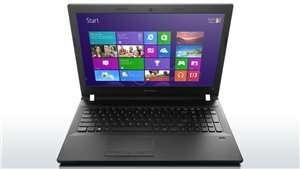 Lenovo E50-80 15.6" Multimedia Laptop Intel Core i3-5005U 4GB RAM 500GB+8GB SSHD. Unlike other business notebooks, the Lenovo E50 doesn't compromise on resolution with its HD display. Keep more windows open at the same time, watch crisper & clearer PowerPoint presentations, or simply kick back at the end of the day and enjoy a movie in stunning hi-res. With up to 6 hours' battery life between charges, the E50 business notebook is an ideal companion for those on the go. Lenovo Energy Management protects the long-term durability of the battery and uses advanced energy-saving technology to increase time spent between charges. Lenovo E50-80: DO MORE ON THE GO, FOR LESS. With powerful processors, the Lenovo E50-80 delivers the performance to increase productivity for your business. The E50-80 turns on in an instant and is always up-to-date. You can multitask quickly, move effortlessly between applications, and collaborate wirelessly in high quality videoconference calls all with the convenience of a longer battery life. You can also guard against identity theft and ensure safe access to your network with built-in security features. Thin and light laptops usually bear a hefty price tag, but the affordable E50 is only 24.7mm (0.97") thick and weighs in at just 2.36kg (5.2 lbs). What's more, it comes in a variety of configurations that are guaranteed not to break the bank. Keep your business data secure with an optional integrated fingerprint reader that locks access to your E50 notebook, allowing only authorized persons to browse your PC. Enjoy a surround sound experience whether listening to music, playing games, or enjoying a movie. Easily connect to your TV or monitor for large-screen high-definition viewing. Move data between the E50 and other devices quickly with USB 3.0 SuperSpeed; it's up to ten times faster than previous USB technologies, and is backward-compatible. This island-style keyboard is ergonomically designed to make typing more comfortable and to reduce errors. The 720p HD webcam will help you enjoy web conferences or online video chats like you're really there. With a big 500GB HDD storage, you won't have to worry about where to put all your data, videos, music, or photos. With 802.11 b/g/n Wi-Fi connectivity, Fast Ethernet LAN, you'll be able to connect to the Internet wherever you go.